Colombo Night Races (CNR) will be held on December 15, 2012 attracting many foreign visitors to Sri Lanka. The rehearsals will take place today (14). Several roads near Galle Face and Colombo Fort will be closed from 6pm today and tomorrow in view of the Colombo Night Races. Chaitya road beginning from the harbour, Janadhipathi Mawatha from Bank of Ceylon Mawatha junction, Clock tower roundabout, Regal roundabout, Ceynor junction and Galle Face roundabout will be closed for vehicular traffic from 6pm today and tomorrow. Justice Akbar Mawatha, Malay street junction, Gamini roundabout and Kollupitiya junction will be closed for heavy vehicles during this time. Buses and light vehicle entering Colombo city are requested to use alternative routes. Vehicles coming from Galle road can enter Pettah and Fort via Kollupitiya junction, Dharmapala Mawatha via Pittala junction, Sir James Peiris Mawatha, Slave Island junction, Justice Akbar Mawatha, Malay Street, Sir Chittampalam A Gardiner Mawatha, Regal roundabout, D R Wijewardena Mawatha, Gamini roundabout, Tehnical junction and Pettah. Lorries coming from Galle road can enter Pettah via Kollupitiya junction, Dharmapala Mawatha, Lipton Circus, Soysa roundabout, Deans road and Technical junction while buses leaving from Pettah can enter Galle road and High Level road from Olcott Mawatha, Ceynor junction, Technical junction, Maradana bridge, Gamini Roundabout, Regal roundabout, Slave Island and Union place. Other vehicles leaving Colombo can use Olctott Mawatha, Ceynor junction, Bo tree junction, Technical Junction, Maradana Bridge, Technical junction, Gamini roundabout and Darley Road. Vehicles coming to Colombo via Reclamation road can enter Fort and Pettah via Khan clock tower, Grandpass junction, Bodhiraja Mawatha, Saunders Place and Olcott Mawatha. 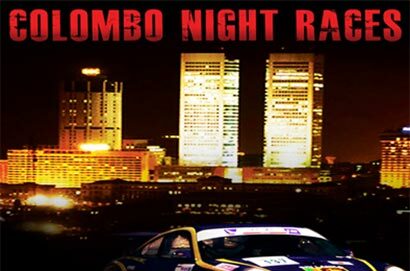 The Colombo Night Races are organized by Carlton Motor Sports Club and conducted by Asian Motor Racing Club (AMRC) and Sri Lanka Motor Cycle Club (SLMCC). According to the organizers seven Car events and four Motor Cycle events are scheduled to be run on this day. The seven car events are conducted by AMRC while the Motor Cycle events are conducted by SLMCC. It was revealed that the Race track will be similar to last year’s track with an extension up to Galle face. The GT-3 and the GT-4 category will be an international event which hopes to attracted drivers from Malaysia, Indonesia and Japan and Hong Kong. The organizers said that all necessary steps have been taken for the safety of spectators by way of placing them in safe places with a good view of the races. I sincerely hope that the people of Sri Lanka will put party politics a side and look this evet as a showcasing Sr Lanka to te world. At the moment the only sport we are know for is cricket and that too does not look good in the near future withh all of our senior players due to retire at almost the same time.This event could bring more foreign excahange to Sri Lanka in the future if it is organised and managed well. I hope the anti MR people can see this far or do they want to look beyond their nose?. Yes roads will be close but will that matter too much at night and the week end. These sort of road blocks for racing car events have been taking place in other parts of the world for years and you do not hear people blaming the Government for this.